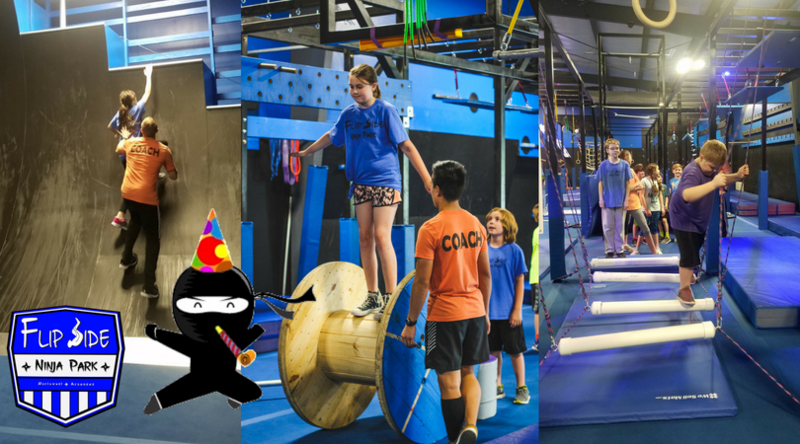 At Flip Side Ninja Park, we offer a birthday party experience like no other facility in Northwest Arkansas can. Your Birthday Ninja and friends get the ENTIRE gym to themselves for an hour and 30 minutes. This includes 1 hour of practicing obstacles, playing games, and running obstacle courses without worrying about other parties or people getting in their way. The last 30 minutes is reserved for cake and presents with all set-up and clean-up done by Flip Side staff so you don't have to worry about anything but enjoying your time. Check out the packages below to see which works best for your party. We can't wait to help you celebrate! It's going to be a ton of fun! What to expect: We'll try and take the stress out of your party prep! Our staff will decorate and set up everything for your party before everyone arrives. Our certified ninja coaches will organize and supervise all of the activities to keep everyone safe and having fun! We'll provide: Set-up and clean-up of the party necessities. This includes: cups, plates, utensils, and decorations. (We will do blue/red ninja warrior themed decorations). All you have to bring is the food and refreshments! *Each package comes with an included Flip Side t-shirt and wrist band for the birthday ninja. What if we book for 15 but 10 or less show up? That's no problem! We can adjust the price to reflect the party size. We will follow up with you a week before to get an estimate so we can staff accordingly. Due to maximizing everyone's time in the gym, please do not arrive any more than 10 minutes before your scheduled time. Waivers can be filled out beforehand online to save time. Do spectators count towards the pricing? We'd love to allow everyone to come in and set up, but due to time constraints (to allow everyone more party and gym time!) we only have 20 minutes to break down, clean up, and decorate for the next party. You can bring some small, personalized items, but please plan on us providing the majority of your decor. Due to liability reasons, we can only allow children ages 5 and up to participate in activities on the gym floor. Does everyone need a waiver?